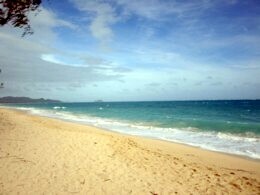 - In search of Oahu Elvis. On 9th November 1957 Elvis arrived in Hawaii for the very first time. Elvis had previously telegrammed the local Honolulu Star newspaper announcing that "I know that I will enjoy your islands, I like to surf and swim. 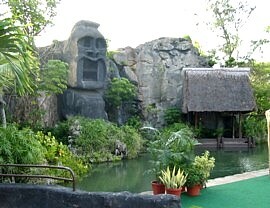 Have read about Hawaiian hospitality and am eagerly looking forward to same." Elvis hopes would of course be realised. It is no secret that Elvis ended up loving Hawaii and its people, and he vacationed there on many different occasions. So on my most recent visit to Hawaii, I thought I would check out some of the places Elvis vacationed, filmed and performed during his many visits to this beautiful island. - Aloha From Oahu, Hawaii ! On 9th November 1957 Elvis arrived in Hawaii for the very first time aboard the USS Matsonia. The previous day Elvis had telegrammed the local Honolulu Star newspaper announcing that "I know that I will enjoy your islands, I like to surf and swim. 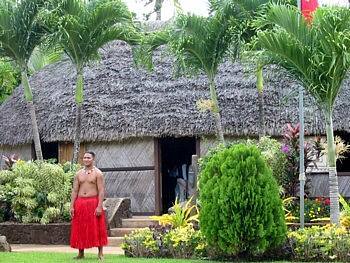 Have read about Hawaiian hospitality and am eagerly looking forward to same." Elvis hopes would of course be realised. 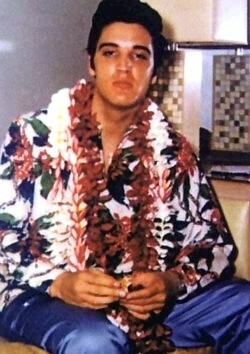 It is no secret that Elvis ended up loving Hawaii and its people, and he vacationed there on many different occasions. So on my most recent visit to Hawaii, I thought I would check out some of the places Elvis vacationed, filmed and performed during his many visits to this beautiful island. 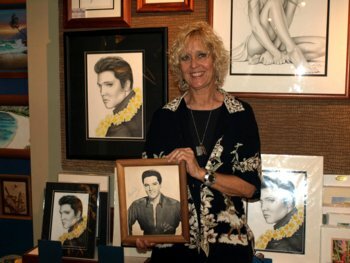 On my travels around the island of Oahu, I was pleased to find that Elvis is still fondly remembered by many of the locals and his memory is still very much alive. My first stop was the Neal Blaisdell Center (formerly the Honolulu International Center Arena) where Elvis performed one of his greatest concerts ever – "Aloha From Hawaii" broadcast worldwide via satellite in January of 1973 – eventually reaching an audience of over 1.5 billion people. The stadium still looks much the same from the outer and a life-like bronze statue of Elvis has been erected out the front of the arena and stands right by the main entrance for all to see. 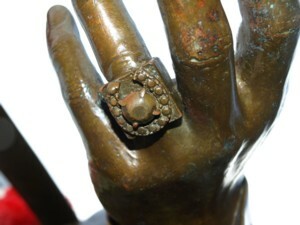 The statue is incredibly detailed, from the gems on Elvis’ American Eagle suit, right down to the the diamond ring he wore on his finger on that incredible night. 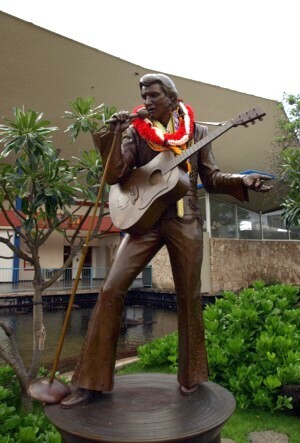 Elvis Aloha From Hawaii. The World’s first satellite TV concert. Jan 14th, 1973. "With supreme talent and sincere humility, Elvis Presley made his gift the world’s. Thank you, thank you very much". It is apparently a custom for fans and visitors to the statue to leave a floral lei, so I, of course, added mine to the many already there. 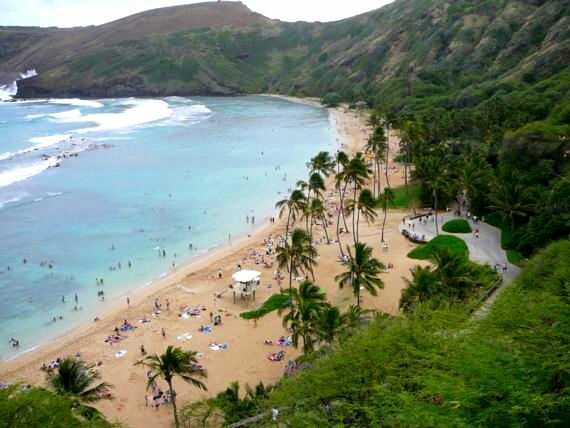 Next stop was a visit to Hanauma Bay, where a good portion of the beach scenes were filmed for Blue Hawaii. 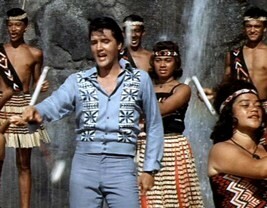 Elvis filmed 2 other movies on the islands of Hawaii – Girls Girls Girls in 1962 and Paradise Hawaiian Style in 1965 but it was Blue Hawaii that was the most successful and memorable of the three. Although the shack where Chad and Maile changed into their swimsuits is long gone, the beach at Hanauma Bay remains breathtaking with its white sand and turquoise waters. 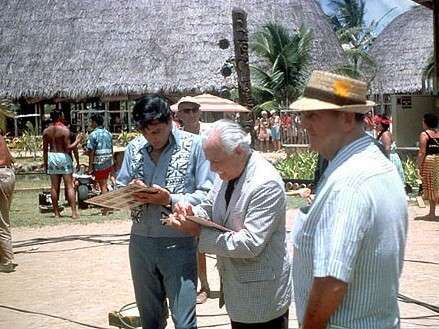 Elvis returned to Hanauma Bay in August 1965 when he filmed the Helicopter rescue scene for Jan (Donna Butterworth) for Paradise Hawaiian Style. From here I decided to drive a little further up the east coast to Lanikai beach where Elvis rented a private home during his last vacation in Hawaii in March of 1977. This pristine beach is still regarded as a private beach for residents only. To make access even more difficult was the fact that President-elect Barrack Obama was vacationing in Hawaii and staying in the prestigious Lanikai area also – so Im afraid it was only photos from a distance this time! 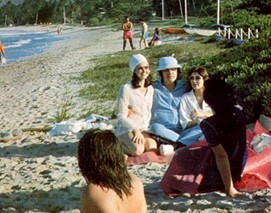 Lanikai beach & Elvis' holiday house, on the last vacation March 1977. Heading back in the mainland of Oahu , my next stop was Pearl Harbour. 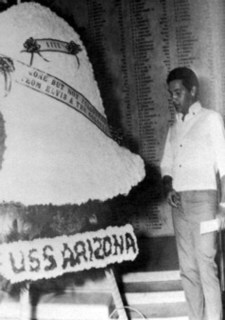 Elvis performed a benefit concert in Hawaii in 1961 to help raise funds for the Arizona Memorial - in remembrance of the many men that died during the Japanese attack on Pearl Harbour in December of 1941. An estimated $500,000 was needed to build the memorial, and only half of that had been raised. 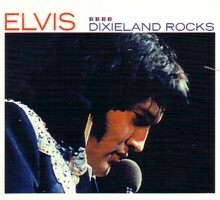 Ticket sales for Elvis’s concert raised some $47,000 – to which he and the Colonel added another $5000. Initially Elvis’ name was displayed on a small plaque at the memorial, recognizing his generous donation, however sadly, it has since been removed as management of the tourist site changed hands. 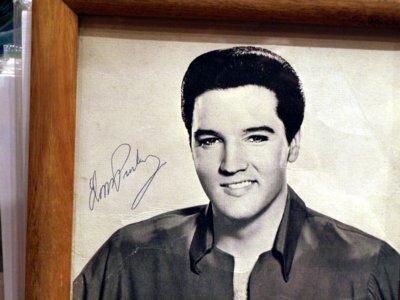 However there is still an acknowledgement of Elvis' contribuition within the Museum itself. 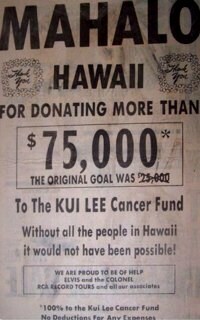 Three official dedications of thanks to Elvis for all his charity work in Hawaii over the years. On my way back to Waikiki Beach in the shadow of Diamond Head (the mountain featured prominently as a backdrop on many scenes in Blue Hawaii), I thought I would visit a couple of the hotels where Elvis was a frequent guest. First stop was the Hilton Hawaiian Village. Elvis stayed here on many occasions, the first being in 1957 when he was in Oahu to perform two concerts at the Honolulu Stadium. 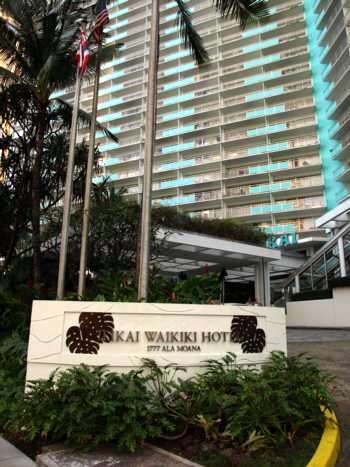 Back then the Hilton was the tallest building in Waikiki and Elvis and his entourage hired out the entire top floor. The "Rainbow Tower" where Elvis stayed in the late 60’s/early 70’s, can be seen in the helicopter arrival footage from Aloha from Hawaii. 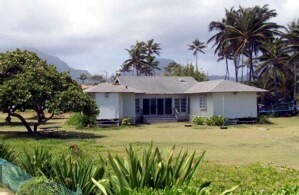 Another hotel where Elvis stayed during his later visits to Hawaii was The Ilikai. 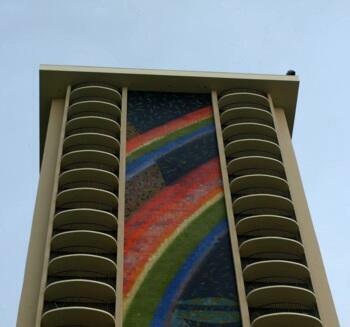 Unlike the neighbouring Hilton, the Ilikai hasn’t been refurbished and upgraded very much over the years and looks a lot like it did in the early 70’s when Elvis would rent out the entire 22nd floor. Naturally, I went up to the 22nd floor to have a peek. I’m not sure what I was expecting to see, but took some photos anyway! 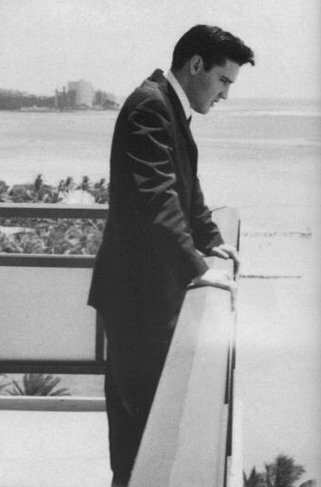 During Elvis’ various different stays at the Ilikai, the restaurant at the very top of the hotel was known as "The Top Of The I", where he used to dine frequently. It was very exclusive and apparently the place "to be seen". It is still a restaurant but has since been re-named "Sarenta". I treated myself to a dinner there, if not for anything else other than to admire the magnificent view across Waikiki and Diamond Head. Another essential Oahu Elvis destination is the Polynesian Cultural Centre on the west coast as featured in Paradise Hawaiian Style. Local Tongans perform a fabulous drum ceremony giving a fabulous ‘Drums of The Islands’ atmousphere. A delicious highlight was visiting the hut that Elvis had used as his changing room (right) during the filming. It must cross a lot of fan's minds that you are in a room where Elvis was once .. well think about it .... if only ghosts could talk! The waterfall & set used in the Paradise Hawaiian Style finale. This was all followed by a delicious traditional Polynesian Lu’au feast right in front of the huge waterfall set used in the film’s Festival finale. The local band entertained with a fabulous Polynesian soundtrack including several Elvis Hawaiian classics. In the setting sun it had a wonderful atmosphere. There is supposed to be a new Elvis Museum opening here soon at the Centre. My final stop, which was not a planned one, turned out to be the most exciting of all. On passing through one of the many hotels on Waikiki Beach, I came across a little art gallery. It caught my eye as there was a large portrait of Elvis with a lei around his neck, prominently displayed in the front window. I wandered inside to take a closer look and was approached by the owner of the gallery – a lovely lady by the name of Kathleen King , who enquired as to whether I was an Elvis Presley fan. My eager response was most welcomed and over the next half an hour or so, I listened intently to Kathleen recall her memories of growing up in Hawaii, seeing Elvis on many different occasions and actually meeting him during one of his visits to the island. Her father was in the business and he had met the Colonel and Elvis for a dinner when Elvis had visited Hawaii in the early 60’s. She recalled that her father had nothing but good things to say about Elvis, noting that he was "exceptionally polite". Kathleen was only a young surfie teenager when she first met Elvis in 1966 whilst he was shooting Paradise Hawaiian Style. When he wasn’t filming, he was on the beach very early most days, around 6am. It was on one of these occasions that Kathleen had the fortune of meeting Elvis. She stood with him as he put his arm around her for a photograph. She laughingly recalls that as she went to talk to Elvis, her voice cracked and she couldn’t get a word out – much to the amusement of Elvis and his group of guys, who had a good laugh at her expense! Her voice had never cracked before and hasn’t since. I asked Kathleen what she remembered the most about Elvis and she said that he seemed very tall and incredibly handsome, so much more so than his pictures (if that is possible!). That day, Elvis didn’t have any of his publicity photos, so he promised the Colonel would bring some back the next day. 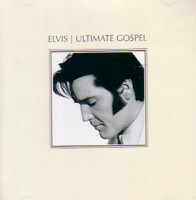 And sure enough, arriving in a big white Lincoln, the Colonel returned with a signed picture of Elvis – which Kathleen still has framed in her home. Unfortunately, she threw away the photo of her with Elvis, because she didn’t like the way she looked as a teenager and perhaps thought she would have the opportunity to meet him again. Unfortunately, she never did and of course, she regrets not keeping the photo! Elvis would arrive by helicopter on many of his visits – landing on the helipad out front of the Hilton Hawaiin Village - which remained there until the late 70’s. Kathleen remembers that she and her sister, who also worked in the area, would keep tabs on his arrivals, alerting each other by "walkie talkies". Elvis was very accessible during the 60’s – he was happy to sign autographs, take photos and chat with the fans, then they would leave him alone to film his movies or enjoy his vacation. 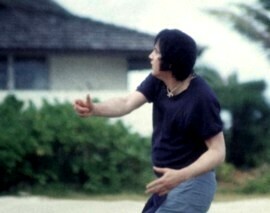 That is one of the reasons Elvis kept returning to Hawaii - he wasn’t hassled or bothered by the press or the fans. Unfortunately when Elvis was in Hawaii to perform his sensational Aloha concert, Kathleen was in Los Angeles, studying at college. However, she remembers everyone on her campus gathering around the TV screen to watch the historic event. 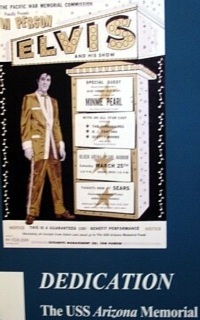 30 years later, the concert was re-enacted at the Honolulu International Center, with the likes of the Sweet Inspirations, the Jordanaires and of course the TCB band. Many members of the audience that were there for that magic night in 1973 returned for the tribute concert and were not disappointed. As Kathleen puts it "everything was just the same, the only person missing, was Elvis". Kathleen is now a talented artist and designer and her store features beautiful and unusual hand-made jewellery, original art and of course a few Elvis pieces. She has many a fan drop by, from "oldies to 4 year olds" and she is more than happy to recollect her memories of meeting Elvis. She remembers him as fun, kind, softly spoken, very charitable and generous man who loved Hawaii and its people, and they reciprocated ten-fold.